These preschool lunch ideas will inspire you to change-up your lunch-packing routine and get your child exposed to a variety of new and healthy foods! Here’s a look at some of the Serbinski boy’s favorite preschool lunches [previously tested out at home and camp this summer]. It seems crazy to me that summer is almost over and we are headed into back to school season. I’m not sure what day it is let alone when my kids start school, but judging by back to school photos hitting my Facebook newsfeed I can say that we probably aren’t far out! This year Joey will be in three-year-old preschool 3 mornings a week, and Anthony will be going to a Mom’s Day Out program two mornings a week. AND I’ll be packing ONE school lunch for both of them—so two lunches each week. Sounds exciting and a little confusing, right?! Monday’s they’ll both stay an extra hour to enjoy lunch with other children their age. That means I’ll just have one lunch-mess to clean-up at home on Monday’s. Lily girl will still be with Mom! Think they are ready for school?! Handsome little devils… I mean angels… I mean brothers. I received a lot of positive feedback this summer when I shared a few of their favorite camp lunch ideas on Instagram, so I figured, hey, I’ll share with you some of my preschool lunch ideas with my go-to packing list! DO NOT think my boys eat everything on this list. Well, I guess they do minus hardboiled eggs, cheese sticks, and tuna salad. It also depends on what hour or day of the week it is because their palates seem to change by that too. We are still working on variety at lunchtime… but honestly, I’m trying to NOT stress about preschool lunch. Or the fact that they eat almost the same thing at lunch every day at home [spoiler alert: I DO TOO!]. So I guess the list is for those of you who have toddlers that eat more than 3 things any given day and need a little inspiration on those days when you don’t feel like packing a lunch! Joey could eat this grilled cheese lunch all day. Every day. And you know what? Some days when I don’t feel like pushing the envelope and I want a grilled cheese, we do just that! Hummus and crackers! The kid likes anything Mom likes, so when I introduced him to hummus he couldn’t get enough. Thankfully Kroger has these Simple Truth individual hummus packs which are perfect for packing lunches! When it comes to serving sizes, I try to gauge what and how much I’m serving based on my children and their own individual appetites. Yes, you can use food labels to give you recommended amounts if you need to track calories and other nutrients for your child [which most of us do not]. You can also use my toddler serving size guide. But again, you know your child best. And what and how much they physically need to get through the school day. If you had a chance to get the list, am I missing anything?! What would your child be happy with his or her preschool lunch?! Here’s a healthy, happy, and sometimes chocolatey-filled school year for all of us! Thank you so much for this, this is so helpful for my 3 and 1 year old! I just recently came across your blog and am so thankful that I have some new favorite slow cooker recipes in our dinner rotation (love the baslamic chicken). I really love your balanced approach to doing the best you can with meals and not getting stressed over it which is so easy to do with all the information out there today! Thanks again! Thanks for the great ideas. 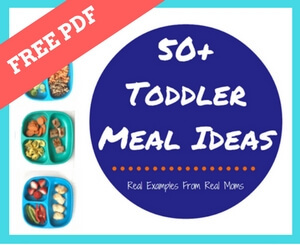 I am always looking for easy ideas for lunches at home & on the go for my toddlers. By the way, I would strongly encourage you to cut up those grapes for your preschooler!! I am an ER doc & that is a super scary choking hazard! I love those lunch ideas! It’s always nice to mix it up for the kids. I’ll have to try these.